One of my data anaylsis pet peeves is false precision. Just because it is possible calculate a quantity to three decimal places doesn’t mean all of those decimal places are meaningful. This post explores how much precision is justified in the context of two common sports statistics: batting average in Major League Baseball and save percentage in the National Hockey League. Using Bayesian hierarchical models, we find that though these quantities are conventionally calculated to three decimal places, only the first two decimal places of precision are justified. We begin by loading hitting data for the 2018 MLB season from Baseball Reference. This data set covers nearly 1,000 MLB players. We specify this model in pymc3 below using a non-centered parametrization. 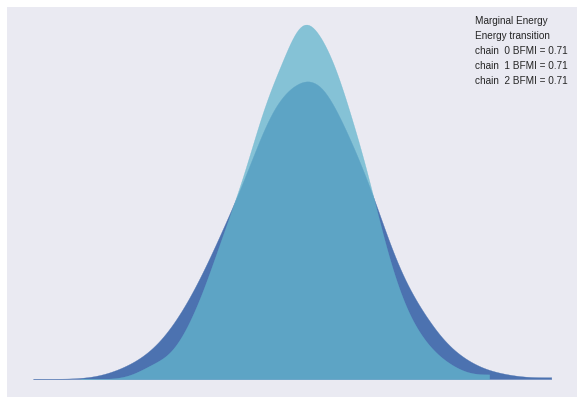 We proceeed to sample from the model’s posterior distribution. Before drawing conclusions from the posterior samples, we use arviz to verify that there are no obvious problems with the sampler diagnostics. 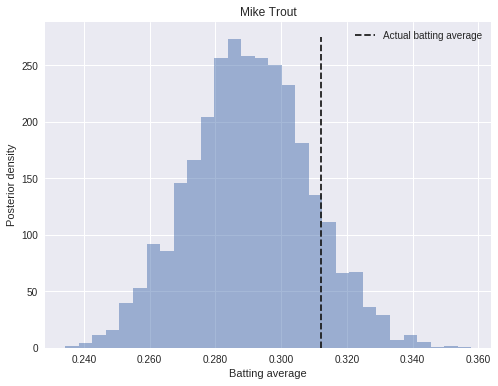 First we’ll examine the posterior distribution of Mike Trout’s batting average. We see that the posterior places significant mass between .260 and .320, quite a wide range of batting averages. This range roughly corresponds to the 95% credible interval for his 2018 batting average. We will use the width of the 95% credible interval for each player’s batting average to determine how many digits of precision are justified. The following plot shows the width of these intervals, grouped by the number of at bats the player had in 2018. We see that, on average, about 100 at bats are required to justify a single digit of precision in a player’s batting average. 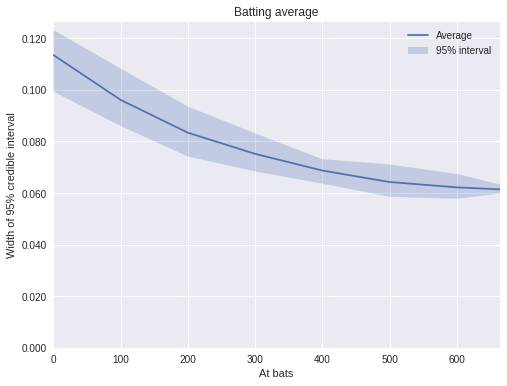 Even in the limit of very many at bats (600 at bats corresponds to just under four at bats per game across a 162 game season) the 95% credible interval has an average width approaching 0.060. This limit indicates that batting average is at most meaningful to the second digit, and even the second digit has a fair bit of uncertainty. This result is not surprising; calculating batting average to three decimal places is a historical convention, but I don’t think many analysts rely on the third digit for their decisions/arguments. While intuitive, it is pleasant to have a somewhat rigorous justification for this practice. We apply a similar analysis to save percentage in the NHL. First we load 2018 goaltending data from Hockey Reference. 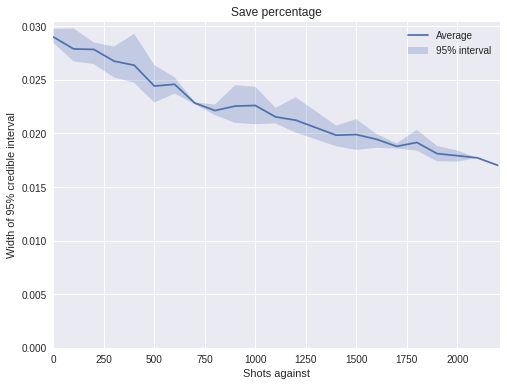 This data set consists of the goaltending performance of just under 100 players. Once again, the convergence diagnostics show no cause for concern. 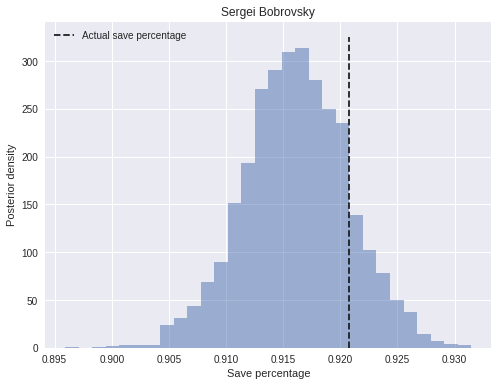 We examine the posterior distribution of Sergei Bobrovsky’s save percentage. We see that the posterior places significant mass between .905 and .925. We see below that the best and worst save percentages (for goalies that faced at least 200 shots in 2018) are separated by about 0.070. Sergei Bobrovsky’s 0.020-wide credible interval is a significant proportion of this 0.070 total range. As with batting average, we plot the width of each goalie’s interval, grouped by the number of shots they faced. This plot shows that even goalies that face many (2000+) shots have credible intervals wider that 0.010, a signifcant proportion of the total variation between goalies. 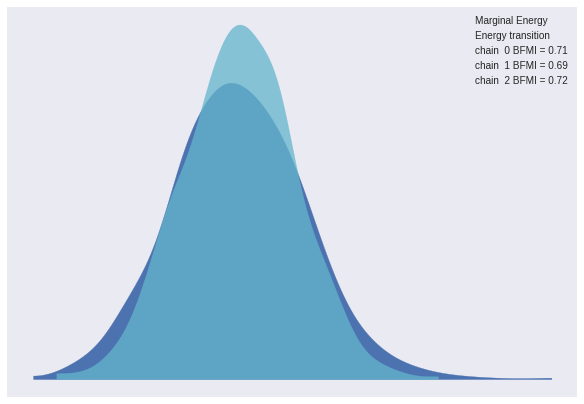 This post is available as a Jupyter notebook here.